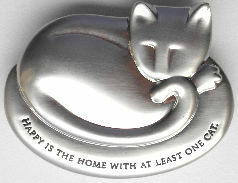 This cast metal paperweight features a sleeping cat and these words etched in the metal: Happy Is The Home With At Least One Cat. 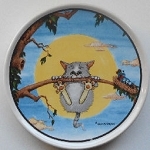 The solid metal paperweight is 3 1/2" wide x 2 3/4" high. Previously owned but in good condition. Original box included. Note: Because this paperweight is solid metal it weighs just over a pound.